- x64 systems optimized version. - Improved/faster html rendering engine for the html to pdf element. - Support for TLS 1.0, 1.1, 1.2 for html to pdf conversions. - Improved PDF parser to support more PDF file types, including files with corruptions. - Search for text in PDF documents (return texts page numbers and position on page). 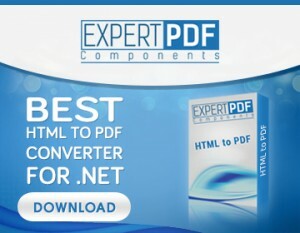 - ExpertPdf Pdf To Image Converter is a powerful, yet easy to use PDF rasterizer. Using it, you can export the PDF pages from your documents to any type of Image in a few minutes. - Export PDF pages from PDF stream or a PDF file. - Specify the range of pages to be rasterized. - Convert PDF pages from password protected PDF documents. - Create thumbnails for PDF document pages. - Get the number of pages in the PDF document. - Improved PDF parser to support more PDF file versions, including files with corruptions. - Better PDF security (40, 128 and 256 bit keys, RC4 and AES algorithms) for the generated PDF document. - 40, 128 and 256 bit encryption keys. - RC4 and AES encryption algorithms.